Have you ever noticed how a sparkling, white smile can brighten anyone’s whole look, and their demeanor? 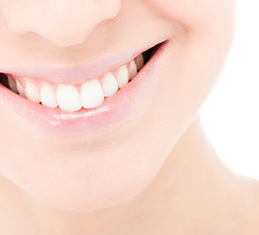 Having a beautiful smile with clean, white teeth is a confidence builder, that’s for sure! We at Vanguard Dental Group in Derry NH are ready to whiten teeth in your own smile that can give you that fresh smile you have always wanted. We offer several teeth bleaching treatments to whiten teeth at our office serving the Londonderry and Windham NH communities. The Venus White in-office teeth whitening system is a very safe and effective way to whiten teeth and lets you obtain the bright beautiful smile you’ve always dreamed of having. With the in-office treatment, your teeth whitening will take approximately one hour. The teeth whitening gel used contains potassium nitrate, which helps decrease sensitivity which can sometimes be associated with bleaching, so your teeth whitening should be very comfortable. For patients who prefer the take-home Venus White tooth bleaching treatment, that is also a great option and very easy to use! After consulting with our doctors Dr. Craig Rothenberg or Dr. Michael Moskowitz, you choose which strength tooth bleaching kit is best for your needs. We will fabricate custom fit tooth bleaching trays for you. These custom fit tooth bleaching trays are extremely comfortable. You can then use the take-home system whiten teeth at your home, and have a beautiful, brighter smile in a very short time! To whiten teeth, tooth bleaching is safe for our patients in the Londonderry and Windham NH area, effective, painless and can give you a smile that will glow and sparkle! Whether you opt for the in-office whitening treatment, or a convenient take-home system, we can help whiten teeth and help you love your smile even more! If you are interested in whitening your teeth, please call our friendly, well-trained team today located in Derry NH. They can answer any questions you have and would be happy to make an appointment for you to consult with our doctors to learn if teeth whitening is right for you. We also serve patients from the Londonderry and Windham NH areas.